Houston got the press (and most of the funds), but the Category 4 storm made first, devastating landfall in coastal Port Aransas and Rockport. How rebuilding has forced these beach towns to confront a housing crisis. The smallish, three-bedroom, blue-green house in the middle of Port Aransas is rather ordinary. Built in the 1970s, the neighborhood a mix of RV trailers and palm trees, on a narrow street with no sidewalks. On a typical day you see as many golf carts as cars riding by. In this little city on Texas’ Mustang Island, the newer homes are mostly up on stilts, and the older ones — like this one — are not. Charlie Bujan lives here. He’s the mayor of Port Aransas, a small tourist town on the Gulf of Mexico. This strip of coastline, known as the “Texas Riviera,” resembles the East-Coast Jersey Shore towns that local vacationers return to, year after year. Everything important is near Bujan’s home, from the famed triangular-roofed fast-food chain Whataburger to the bathing suit/flip-flop/t-shirt stores a few blocks away. Downtown bars, higher-end restaurants and waterfront marinas are not quite walking distance, but almost. And the ferry service that links the island to the mainland is just a mile from his front door. His statement has more resonance these days. This is where Hurricane Harvey made landfall on August 25, 2017, with 130 mph winds and 20 inches of rain. Port Aransas and neighboring Rockport are still digging out from the devastation, eight months later. Blue tarps cover many roofs, hotel windows are boarded up, and a large number of restaurants remain closed. Many homeowners are waiting for insurance settlements that depend on processing from federal and state agencies. The estimate of Harvey’s damage ($125 billion) is second only to Katrina (at $160 billion) as the most costly hurricane ever to hit the U.S.
What most Americans — and many policymakers and emergency-fund distributors — don’t realize is that Harvey hit this part of Texas with the strongest winds for a U.S. hurricane landfall since 2005. But after it struck these barrier islands, leaving few buildings standing and decimating the local tourism and petrochemical industries, Harvey lingered inland for a few days and then traveled toward Houston, 200 miles to the northeast. By then, it had been downgraded to tropical storm status, but still dropped 50 inches of rain. Houston’s population is exponentially larger than either Port Aransas or Rockport, and given how the media covers weather events, the Bayou City got exponentially more attention for flooded homes and highways than the smaller coastal cities got from hurricane-force winds that collapsed buildings and blew boats down the road. Most Americans remember Harvey news footage of boats rescuing motorists from flooded Interstate 10. The stories were scarce of Port Aransas residents going without shelter, electricity and water for weeks. Has that affected how recovery funds have been disbursed? In April 2018, Texas and the U.S. Department of Housing and Urban Development (HUD) announced about $5 billion in federal block grants for disaster relief. Houston and surrounding Harris County received $2.3 billion of the grants, while the other 48 counties affected by the hurricane split the other $2.7 billion. The irony is that Aransas County, population 23,000, had more single-family homes destroyed from the hurricane (867), than did Harris County (845), with its population of 4.5 million. The mayor, who is 73, received a recent bit of good news: he got to sleep in his own bedroom once more. Harvey had taken the roof off of his home above the bedroom, though it was left intact over his kitchen. So he and his wife, Sherri, moved their bed into the kitchen, and had been sleeping there since September, while they awaited approval of the insurance and bank and government forms to pay for the roof fix. Now that it’s done, they moved their bed back into the bedroom, “and stopped having to sleep next to the kitchen sink every night,” he says with a laugh. The size and wind speed of the storm, plus the relative isolation of these barrier islands, were a lethal combination. Harvey was a Category 4 storm when it hit the Texas coast, with wind speeds of 130 mph; only Katrina (2005) and Andrew (1992) have hit the U.S. coast with stronger winds. And the big cities are not nearby: Houston, Austin and San Antonio are all 200-plus miles away. Corpus Christi, with a population of 325,000, is closer, about 40 miles away. This part of Texas has a long, diverse history; Native Americans lived here for thousands of years, until Spanish settlers sailing the Gulf of Mexico landed in the 1500s. In subsequent years, this strip of coast was disputed in multiple wars, from the French and Spanish War to the Texas Revolution to the Civil War. “This is a place that bikers and shrimpers have always loved, because all we care about is the next few hours, not next week,” says one Rockport bartender. That cross-cultural appeal is different from what you find in other parts of Texas. Port Aransas and Rockport sit along the Intracoastal Waterway that runs from South Padre Island to Galveston; big carriers use these shipping lanes to move oil and gas product to refineries. But interestingly, here you also encounter significant environmental acreage, including the 114,000-acre Aransas National Wildlife Refuge, where endangered whooping cranes spend their winters. One can see offshore oil rigs being hauled into the gulf, as fishing boats follow behind. This independent spirit has made the coastline a popular middle-class vacation spot, the kind of beach destination that attracts oil-rig workers and Austin government employees for a weekend escape with the kids — more Ocean City, New Jersey, than Martha’s Vineyard, Massachusetts. Over time, the vacation profile of these towns has changed, and the hurricane has forced residents to confront the implications of the shift. As early as the 1970s and 80s, more northern retirees began to see this sunny strip of coastline as a better place than Florida to park their RV for six months every year. (“Better” in this case means cheaper and less crowded.) Over the past 20 years, baby boomers have snapped up low-cost condos near the beach as second homes, renting them out during the summer. Over time, Port Aransas (pop. 5,000) and Rockport (pop. 10,000) found they were dealing with less of a spring-break college crowd — students being chased by police in the dunes — and more of a wine-and-cheese, art-gallery crowd. This change spurred an affordable-housing crunch that grew steadily tighter in the years before the hurricane hit. Put plainly, the construction of $300,000 condos for retirees has far outpaced construction of apartments for the workers who would serve those retirees in local restaurants. Most East- and West-Coast beach spots long ago reserved sections of their towns for the working-class housing to support a hotel and restaurant labor force. But in Port Aransas and Rockport, given their barrier-island isolation, and the ferry boats needed to move people around, the focus on higher-end property development in recent years has created an affordable-housing crisis. At this point, a restaurant busboy can only afford to live a half-hour away. “Our biggest challenge [housing] is the one [local governments] have the least control over,” Koerner says. Now, post-Harvey, the problem is bigger than ever. For example, a local Walmart could not stay open 24 hours, because the storm destroyed all the older, cheaper housing and it couldn’t secure sufficient new housing for its workers. Hotels and restaurants may have needed this long to get buildings back in order, but now, finding people to work in them is more difficult than ever. Especially at this time of year, when tourism ramps up and the demand to fill jobs follows close behind. “No one wants to say this, but any chance we had of recovering quickly fell off the map when that storm hit Houston,” Martin says. Texas economist Ray Perryman agrees, to a point. “The ongoing story and devastation in the much larger Houston-area population center drew attention away from the communities further south along the Texas Gulf Coast which sustained the brunt of the wind damage,” he says. “Six months later, there is still much to be done, but areas are again functioning. Given the dependence on tourism, funding rebuilding has been particularly challenging. Cities have been engaging in repairs even as tax receipts have been reduced due to the closure of hotels and motels and retail outlets. Things have improved somewhat. Just last week, The Tarpon Inn in Port Aransas, one of the oldest hotels in Texas with operations dating back to 1886, reopened after being closed for eight months. The last time this famed hotel had been closed for this long was after the Storm of 1919, a Category 4 hurricane that killed an estimated 600 to 1,000 people. Where Are the Recovery Funds? Many anticipate that private-market influx of spending. But it’s the uncertainty of public-sector spending that has caused the biggest problems. Much of the concern centers on the fact that Houston has serious advantages in influencing political spending decisions. Crisis avoidance depends on local revenue. Port Aransas, for example, has lost an estimated $300 million in property-tax value from the hurricane, causing the city to lay off 10% of its work force and save about $700,000 next year, according to Mayor Bujan. Less city staff will make recovery more difficult. School districts have been hit hard as well. The Aransas County school district has lost $4.3 million in local property-tax funding for next school year, a decline of about 10 % of their total budget. That district also sustained $55 million in damages to its buildings, while the Port Aransas school district suffered $12.5 million in damages. A shortage of staff to wade through government red tape can set things back for years. “This all gets very political, and these small towns often don’t have a clear path to ask for what they really need,” says Heather Wade, a long-time urban-planning adviser to Texas coastal communities and an associate director for the Texas Sea Grant College Program at Texas A&M. How this will play out is unclear, given that these small cities face years of recovery. Port Aransas and Rockport have a tourist industry that will likely rebound in full force; the bird watching and fishing and wildlife refuge areas will contribute heavily to that. The U.S. Small Business Administration has also made $200 million in home and business loans to the Port Aransas and Rockport home counties. While that’s substantially less than what has been paid out in the Houston area, those loans seem fairly allocated, based on population. But with the HUD grants, Houston and Harris County took 45 percent of the $5 billion. The six counties including and surrounding Rockport and Port Aransas received just $282 million in homeowner assistance and local infrastructure grants — less than six percent of available funds. Additionally, HUD has earmarked $250 million for an “Affordable Rental Program” for areas hit by Harvey, but hasn’t designated to which cities and counties that money will go. If this program mirrors the percentage allocations of the other HUD grants, then the Port Aransas/Rockport area will receive just $14 million in affordable rental help, while Harris County and Houston will score about $110 million. 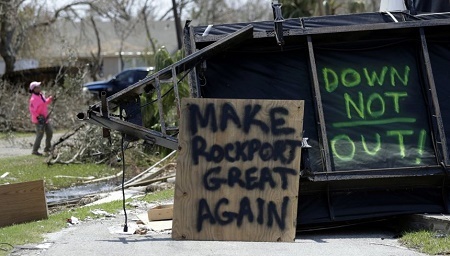 Photo: Despite delays and red tape in securing disaster-relief funds, Rockport residents are determined to rebuild. Source: Eric Gay/AP.